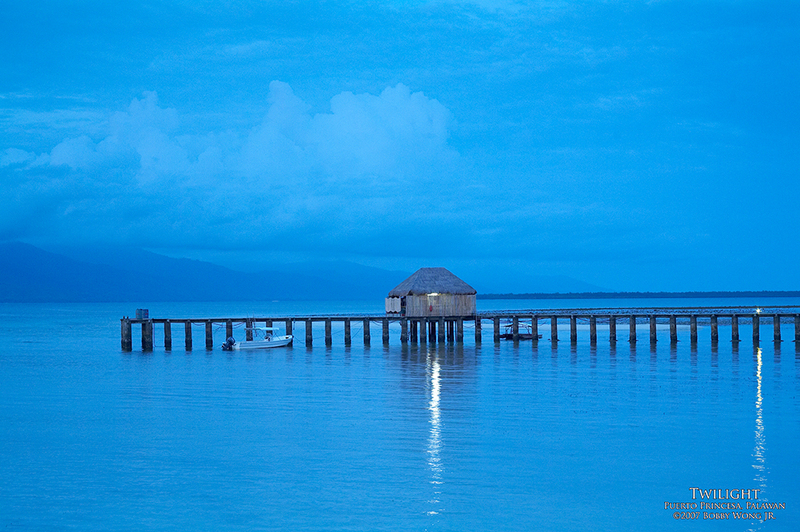 On the island of Dos Palmas in Honda Bay, off the coast of Puerto Princesa in Palawan, we were greeted by a rare blue dawn. Experienced dawn stalkers know sunrise is usually preceded by a pitch-black sky. And if there are any clouds overhead, they herald the king's arrival by flashing pink or crimson, before turning orange or red. Finally, all color usually disappears momentarily before a brilliant flash of light signals it's all over. But this morning was different. It was cloudy all the way to the horizon. The sun eventually rose behind the clouds and the sky did brighten up, but without the usual sequence of colors we came to expect. Looking around us, in all directions, it was just an eery featureless blue. Well let's take a shot anyway.....click... oh it's blue! Duh! Thanks a lot. Still, twilight photographers understand there are a finite number of dawn's they can witness. Every opportunity must count. Looking around we saw this grass hut in the middle of a long wharf, and with the reflection from its lone light, it seemed to be waving at us saying... hey how about me... how about me? Couple that with the pungent smell of the ocean at low tide, and the near complete silence as is common at twilight... hey... that could work right?. Who said dawn shots need to be a fire-y orange anyway? (Yes, even twilight photographers can sour grape!) Enjoy. i've seen purple dawn or sunrise but not blue. This is really beautiful! It's beautiful. Maybe not as dramatic as pink and orange sunrises, but definitely more peaceful. You caught a moment in transition. Sublime. An Atenean dawn! The blue of morn! Isn't this where the tourists were kidnapped by a band of Abu Sayaff several years ago? amazing. i have never seen a blue dawn.